Iran poses the "most significant threat" in the Middle East, where its nefarious activities and support for terror organizations have grown since the announcement of the landmark nuclear agreement, according to the top U.S. military commander in the region. The United States has "not seen any improvement in Iran's behavior" since the nuclear agreement was inked, according to U.S. Central Command leader Gen. Joseph Votel, who warned Congress on Wednesday that the Islamic Republic is boosting its support for militias in Syria and Iraq while building large numbers of ballistic missiles. Votel, testifying before the House Armed Services Committee, opened his remarks by stating "Iran poses the greatest long-term threat to stability in this part of the world." Growing U.S. concerns about Iran's nefarious behavior since the nuclear agreement have prompted calls from leaders such as Votel to adopt a stronger military posture against the Islamic Republic. President Donald Trump's White House has an opportunity to get tough with Iran as it continues to harass U.S. military assets in the region, according to Votel. 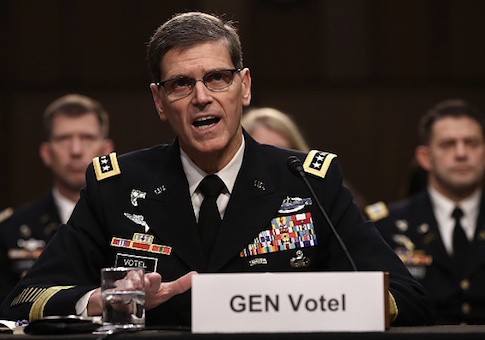 "Through both messaging and actions, we must also be clear in our communications and ensure the credibility of U.S. intentions," Votel stated in his written testimony. "Iran must believe there will be prohibitive consequences if it chooses to continue its malign activities designed to foment instability in the region." The United States consistently is faced with "a range of malign activities perpetrated by Iran and its proxies in the region," according to Votel, who pointed to interference by Iran in Iraq, Syria, and other areas. In addition to Iran's "nuclear weapons potential," the country poses several "credible threats," according to Votel. These include its "robust" ballistic missile program, cyber threats, and the continued harassment of U.S. forces stationed in the region. Iran's Revolutionary Guard Corps, or IRGC, also poses a significant risk due to its clandestine efforts to foster terrorism against U.S. allies, according to Votel. "We must make sure that we are postured for purpose in this region," Votel said. "We must have a credible, ready, and present force." There is mounting concern that Iran may begin targeting U.S. forces in Iraq, where it has long supported government-tied militia groups fighting against ISIS forces. While Iranian-backed militias in Iraq have mainly worked to fight ISIS, they could turn their attention to the United States at any time, according to Votel. "We remain concerned about Iran's efforts to prop up the Syrian regime against the opposition and its desire to exploit Shia population centers to increase their malign influence, not just in Syria, but also in Arab states across the region," Votel stated in his testimony. "We are watching closely for indications and warnings of decreasing Iranian concern regarding the threat posed by ISIS, leading to a potential shift to targeting U.S. and coalition personnel and infrastructure in an effort to influence a potential long-term U.S. security presence," he said. Iran also is seeking to foment unrest in Yemen, Lebanon, and the Gaza Strip. Its growing relationship with Russia poses regional concerns, Votel said. "Iran fosters instability by funding and promoting a threat network that employs provocation, violence, and covert arms transfers that serve as the stimulants for a range of conflicts across the region," according to Votel. "It complements this subversive arm with conventional military provocation and overt threats to close key maritime sea lanes, especially at critical international economic chokepoints, namely the Strait of Hormuz and the BAM Strait, which puts global political stability and economic prosperity at risk." This entry was posted in National Security and tagged Iran, Middle East. Bookmark the permalink.